The Dr. Brown's Soft Spout Training Cup did well in our tests for leakage, but not much else. This cup had a nice soft silicone spout, which earned it a few points for eco-health, but the spout was difficult to drink from compared to the other cups we tested. It needed significantly more sucking power than the average cup, and this hurt it in the eco-health metric as well as ease of use. Plus, the body of this cup was made from plastic, and that hurt it in the eco-health metric overall. In addition, the cup did not score well for ease of use, or cleaning. In general, there just wasn't much to like about the cup beyond the clear volume markings, and the double handle design (something most transitional cups had). This was just not a cup we could recommend. Dr. Brown's Training Cup has undergone some minor changes. The handles are a different shape that Dr. Brown's claims is more ergonomic for small hands. Also, the lid now opens on a hinge, keeping it permanently attached to the bottle. The shape of the bottle and the valve both remain the same, so functionality is likely not much better than before. The Dr Brown's Soft Spout Training Cup is a transition sippy for babies moving from bottles to cups. It comes in a soft silicone spout, that is gentle on baby's gums, or a harder spout for teething babies that can be interchanged later. The cup offers a two handle spout design, is made from BPA-free plastic, and silicone. It is manufactured by the Handi-craft company, and is widely available online and in some stores. This cup is a clear plastic, and while we aren't fond of plastics in general, we did like that this cup had clear volume markings on the side, and that the clear design allows parents to see how much fluid has been consumed. We also like the soft silicone spout for its gentleness on baby's gums, and that it wasn't made of plastic. If it had been easier to drink from, or ease of sucking, it might have been a real asset to the cup, but the hard to work valve prevented us from loving it. The two handled design and lightweight aspects were also assets to this cup as they assisted babies in gripping and holding cups comfortably for longer durations. This cup scored well in our tests for leakage, as a sippy cup should. 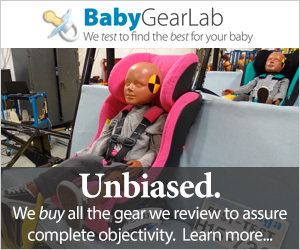 It score a 10 of 10 for the side test, and a 9 of 10 for the upside down test. This meant it might drip a few drops, but nothing major, or anything that would prevent you from loving the spill-proof mechanism of this cup. This cup had a harder than average ease of sucking, especially when compared to the other cups, it was more difficult to drink from in our tests. We liked the spout design and construction of silicone, but we didn't like how hard it was to drink from. We think babies might grow frustrated attempting to drink from it. The hard to drink from valve also meant it did not align very well with the American Dental Associations suggestion that children only use a valve free cup. The extra required sucking action might impair overall oral hygiene over time. We did not like that this cup was made of plastic. For this reason it earned a fairly low eco-health score. While the plastic was listed as BPA-free, the manufactures did not comment on what kind of plastic was used, or whether or not it had been tested for leaching properties. Because parents are unable to confirm what plastic was used, we prefer erring on the side of caution and avoiding plastic when possible. If plastic cups are chosen, we suggest they are hand washed, and never heated in a dishwasher, microwave, or left in a hot car. The heating of plastics has been shown to increase the potential for degradation of the plastic. Dr Brown's transition sippy is well-crafted and lightweight. It offers an interchangeable spout for purchase, so the body can be used through various life stages. The cup is clear and has obvious volume markings, which makes monitoring consumption a snap. However, this cup was difficult to drink from in our tests, and harder to assemble and clean than many of the other cups we tested. Overall his cup earned 62 of 100 points in our tests, which made it better than some cups, but just not good enough to be a cup we can recommend. The competition is stiff in the world of sippys, and this cup just doesn't have what it takes to come out on top. If you are looking for an economical, easy to use sippy cup, you might consider our Best Value winner, Gerber Graduates Sip and Smile, which is easy to use, easy to clean, and doesn't leak at all. It scored a 79 of 100, the second highest of any plastic cup in our tests.